Edited to add: We, (referring of course to the royal we...) have a winner! Click here to read more about her! This is my first ever participation in a Bloggy Giveaway Carnival! I'm very excited. I'm not exactly sure why, but I'm finding it exciting. Hey - I'm a SAHM... I got excited when a door-to-door salesman rang the bell Friday afternoon and offered promises of a clean house and increased property values if I bought a $70 bottle of his cleaning potion... So far the bottle hasn't moved, but I'm watching it closely for the first signs of life... Am I wrong to think that for $70 the bottle should actually do the cleaning itself??? Anywho - I do want to say, "Thanks for stopping by". I love the convenience of having guests when I'm in my PJ's and it's "OK". But - you didn't come here for that... you came for the goods! So on to it. This giveaway is supposed to "reflect me" so I figured the easiest way to do that right now was to give away something "scrappy". Who knows... maybe I'll give away something "weight loss" oriented next time... or maybe one of the kids... But for this time it's going to be something scrappy. I'm giving a brand new set of rubber stamps called Chanteuse, by Inque Boutique. This is a limited edition set - there are only 1,000 out there - and Chanteuse is the mirror image of the Nightingale set that is available for sale at the Inque site. 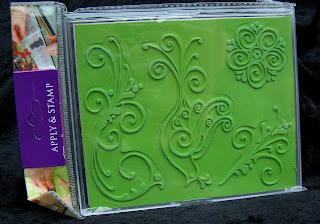 The style (swirly & birdy) is very popular with scrapbookers and paper crafters right now. So even if you're not one of those yourself - this would make a nice gift... But be warned - it does say "Promo Only" and "Savoir Free!" on the package... So the recipient might think you a cheap skate... But on the flip side - it also says, "a $10 value!" So that's something, huh? If you haven't guessed yet, yes... I won these in a contest/drawing - but I've got so many swirly stamps... and believe in sharing the "wealth". These have never been used, but from what I know, they work just like the popular clear acrylic stamps, in that you can see where your design will be stamped due to the close cut of the rubber to the design and the design placement markings on the back of the stamps. They store nicely too - this set fits nicely in it's CD case and even comes with customizable labeling for the side or the end, so you can easily find it later. This contest is open to United States and Canadian mailing addresses. The contest will end Sunday, April 27th, at midnight CDT. One winner will be chosen from the comments by Random.org and notified by e-mail on Monday, April 28th. If the winner does not respond within 3 (three) business days another winner will be drawn. Leave me a comment (link at the end of this post) before midnight on Sunday, April 27th, and tell me what you'll do with these stamps when you win them. You don't have to be a "blogger", but be sure to leave me your email address in your comment or in your blog profile so that I can contact you. Click here to get back to Bloggy Giveaways and enter some more giveaways! Thanks for playing! Very nice giveaway! Thank you for the opportunity!! No matter how many swirls you have, you never have enough.I would use in a class project, send you a card and you would want the set back. I acutally used a set of stamps from this company for the first time this past weekend. I loved them. I wish I had bought the stamp set while I was there because they had a super cute little bird in the set! Great stamps! These would be great to use on nootbooks or scrapbook pages. I host a once a month scrapbook day for the girl scouts in my area and I'm always looking for fun things to add to my stash for them!! These are lovely! I would definitely use them to stamp fabric for clothing! I like to make my own greeting cards, so I would most likely use them for that. I would love to be entered in your giveaway. I would love to use them for scrapbooking and making cards! I love them! Very nice giveaway! I don't have any swirly stamps so I'd put them to good use making something!! Oh these are lovely! They would make some lovely cards and scrapbook pages!! great stamps... I would use them on my layouts and cards. they would make a great background or even accent. a girl just can't have toooo many swirls can she? I would use these stamps for scrappy projects that I make for other people. Those are very nice stamps! Something tells me they'd be great for a Mother's Day card or two. Thanks for the giveaway! Those are really pretty!!!! Heather S.
I love swirly stamps! I would not give this away. This would be totally for moi! Ohhh...This is where you leave a comment. I didn't read all the small stuff under your blog entries. Anyway, I always enjoy reading your blogs. You are an inspiration with the weight loss. Even tho I have only lost 8lbs. Your kids are so talented! I just love the penquin sculpture. What detail for a boy his age. I see why you just had to have that outfit for your daughter...she looks so adorable in it. Love the 911 story. I'm glad I'm not the only one that has happened to. Only I was awaken at 1:30 in the morning with them at the door. Apparently, my stepdaughter didn't believe that they showed up either. I am going to decorate my envelopes that I send out!! Thank you. They're very nice! I'd use them to scrapbook with! They're very pretty - thanks for the chance to enter! I will make some thank you cards. Thanks! Those are beautiful! I love scrapbooking, and am just getting into stamping. I think these would make a wonderful addition to some cards I am working on!!! Thanks for having a giveaway. 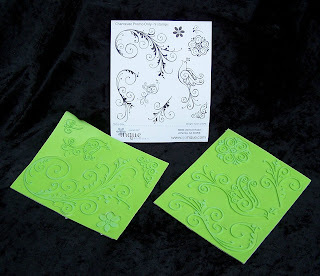 I enjoy stamping and have been wanting some "decorative" type stamps - these look great. I would use these stamps to make cards. I would love to use them to create some great cards!!! I think that the swirlies would make excellent background stamps. I have recently started using more stamps and I would like to play with these bad boys. I would also share them with my momma who is becoming a simply FABOO card maker! I would actually use these as an embroidery template and would love them! Thanks for offering it! Those are really cool... when I doodle, it tends to be swirls like those, but sometimes I'm really hesitant to just draw on something if I actually want it to be a thing, because sometimes I mess up. I love stamps though! If I won those I think I'd use them in my daughter's scrapbook - which is only to age 6 months and she's 3 1/2!!! Cool! If I win, I would share with my daughter. I love stamps! I am a demo for SU. One cannot have too many stamps. I love card making and scrapbooking. Pick me! Those stamps are so cool! That is the one thing I don't have very much of are stamps. I think I'd end up using these first on my wedding album pages. Thanks for offering them up. These stamps would be perfect to use in my cardmaking! I would love them! Thanks! Come check out my scrapping giveaway! Love your sense of humor! Yes, I too think that bottle should stop being so lazy, get off it's keister and start cleaning! Cute, cute, cute! I would use them frequently on my scrapbook pages! Oh how my friends would be jealous...it's ok though, I would share!!! Thanks! Hi, My friend loves to make cards and her birthday is soon. Please enter me in your delightful drawing. Well, we have a vast array of stamps but none like the ones you're giving away. They would make great card designs. My oldest daughter loves to make her own cards and is quite good at it. She's 17, so I'd probably give it to her and let her create away. I love stamps! Great Giveaway! If I won these stamps, I'd use them to make some nice cards for my mom. altered books,cards,wrapping paper,wall art,embellish clothing...is that enough??? BTW, I covet these and I have NONE! I'll definitely use them for scrapping! I'm new to altered art creating so I'd use the stamps with some of my creations. thanks for the opportunity. Very pretty-I don't have anys tamps at all. I would love these! Thanks for a chance to win! Great giveaway; I'd love to win. thanks and please enter mine, too! I would LOVE to win these stamps! I love making homemade cards and I can already see the beautiful creations I could make with these stamps! Please enter me. I love making cards and scrapbook pages with stamps and this set is great! I would love to win this! I would scrapbook with it of course! Please enter me. I'm just building my rubber stamp collection, this would be great! I would use these to make cards! They are really pretty stamps. Nice stamps! I would use them in my scrapbook! Very cool! I would use these on cards for my next card exchange. Thanks! I think I would use them in my wedding scrapbook that I've been putting off! If I had these stamps, I would probably make a giant stack of homemade cards since my supply is getting low. I love stamping and scrapbooking and card-making! Thanks for the great giveaway! oh my! i am a scrap-a-holic and since i am a new member of this totally awesome adiction i am ashamed to admit that i do not have any swirly stamps! i do hope i am the lucky gal! I need a "swirly and birdy" stamp! I wish I had these when I was making wedding invitations ;) Very cute though, I would love to be entered. I'm all about bird stamps lately. Had to check multiple Hobby Lobbys to even find the ones I was looking for recently. These are fabulous, and I'd love to win them! these would be very handy and nifty to use; you are giving and thanks for your generosity. I have never stamped but would love to try! Thank you! I love stamps like these. They aren't cutesy characters and can be used almost anywhere. I'd use them on several of my scrapbook pages. Probably with paint instead of ink to give them more POW. So cute! I would use them to make stationery. Thanks for the giveaway! Very awesome thanks for the chance. I would decorate envelopes when mailing letters and even bills. It would brighten up the postal service. I am a new scrapbooker and new to card making - I would use the stqamps for those crafts! Ooh, pretty!! I'd use them for embellishing my art journal pages. Loverly! Thanks! I'd give them to my friend--she's going through a very rough patch in her life right now, and she loves stamping but can't afford much. My email addy is in my blogger profile, in case I win! I'm hoping to surprise my mom by doing up an album of their wedding photos (copies), so I'd use this to embellish the pages! i'd send this to my friend arlene since i know she'd like it and can't get anything right now for herself. My mother is into arts and crafts so if I win this, I am going to put them in a Mother's Day basket I'm putting together for her because I know she'll love this! Great giveaway! I hope i'm the lucky winner! :) i'd use this for some custom cards and gift tags! I'd use these stamps in my mini album I am currently working on. Thank you for the opportunity! I'll give these stamps to my nieces, they always come up with more creative ways to use things! I would add them to my stash so one day I can sit and scrap and stamp to my heart's delight! I love the swirls, I was actually palying around in photoshop with some designs similar to those. I would use the stamps to make cards and tags so my gift giving can have a more personal touch. I'd love to make cards with them!